I know I should have been making my own stock all along. But it took moving to Israel, where all they have are overly salty bouillon cubes and soup mixes to light a fire under me. I was going to make soup, so why not start with the broth? I found a recipe for Quickest Chicken Stock in Mark Bittman’s How to Cook Everything that looked unbelievably simple. And it was. I had to make some variations based on what I had available. I am writing the recipe as I made it, but know that if Bittman had his druthers he would have added a celery stalk, a bay leaf, and parsley (instead of cilantro). He also has a bigger pot than I so called for 14 cups of water instead of my measly 8. The rosemary, thyme, and oregano are my additions. Even with my substitutions it came out great and I had enough for soup and leftovers. I will try to do this from now on. 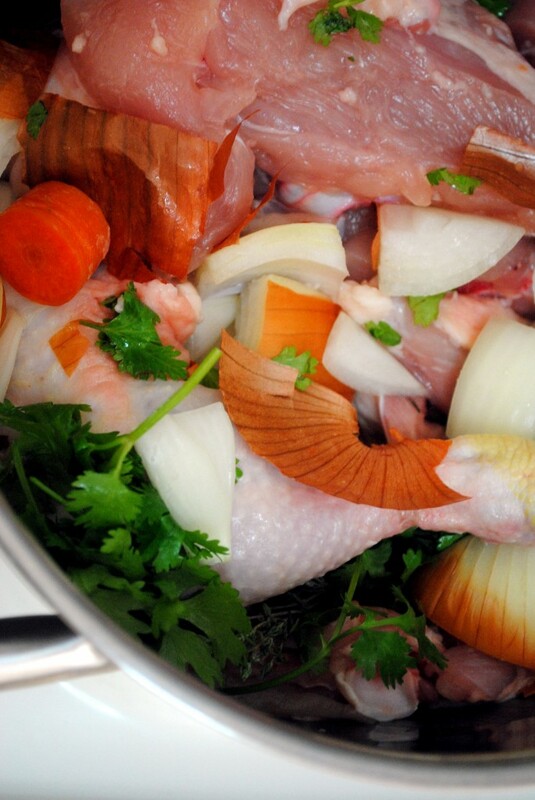 Stock can be kept in the refrigerator for three days or frozen for three months. A good trick is to freeze it in ice cube trays so you can add a little bit as needed. To clarify the stock and make it a consomme, strain it through a cheesecloth or, in a pinch, a coffee filter. On a not completely unrelated side note: I did not lug How to Cook Everything with me to Israel. In fact, I don’t have a single physical cookbook with me. Something I am beginning to regret, but no time to dwell. I have been relying on the internet and my iPad, which has sufficed. I was thrilled to discover the How to Cook Everything app and recommend it to everyone – it’s currently only available as an iphone app, which means it looks little on my screen but works great. It gives you access to all the recipes in that heavy tome for $4.99. SO worth it. 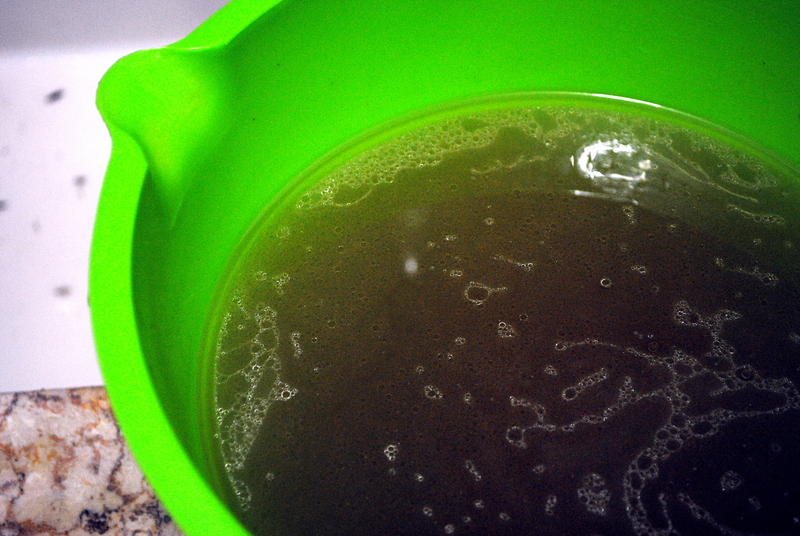 Combine all ingredients in a pot with 8 cups water (or up to 14) on high heat. Cook for 30 to 60 minutes, until the chicken is done. Cool, strain, and season with salt and pepper. Set aside the chicken for another use and discard the vegetables. I love the twist using cilantro. I am going to try that next time I make my stock. 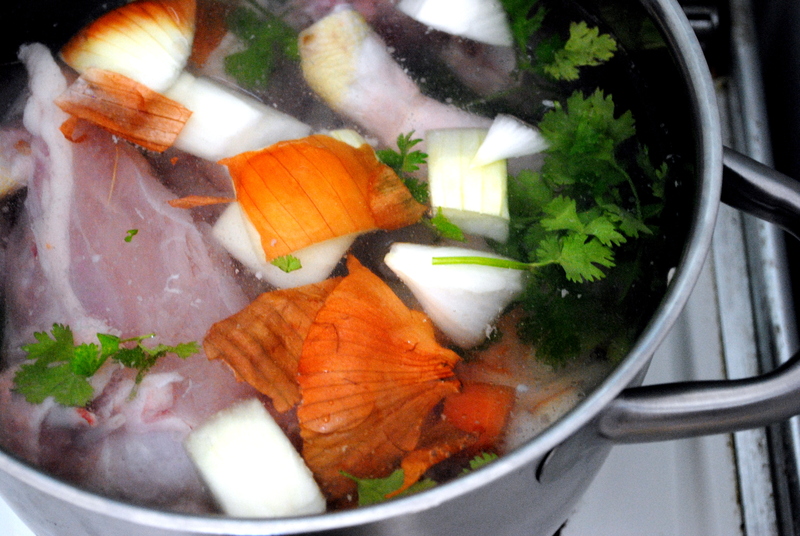 If you enjoy good stock I have a recipe on my blog you might enjoy. Have a lovely day! Thanks Laurie! Lately I have also been throwing all of my vegetable scraps (onion and garlic peels, carrot ends, herbs, etc) into a bag in the freezer. When it’s full I make a robust vegetable stock! I will definitely check out yours.